Cast: Johnny Depp, Penelope Cruz, Geoffrey Rush, Ian McShane, Kevin McNally, Sam Claflin, Astrid Berges-Frisbey, Gemma Ward, Richard Griffiths, Stephen Graham, Roger Allam, Keith Richards, Judi Dench. Rated: (for violence, some frightening images, sensuality and innuendo). Reviewed by Dustin Putman, May 17, 2011. Special Note: "Pirates of the Caribbean: On Stranger Tides" is being released theatrically in a number of formats: 2-D, 3-D and IMAX 3-D. Typically, one would assume that the IMAX version would be the most preferable because it would be of the highest technical quality on the biggest multiplex screen. 2010's "Tron: Legacy" looked stunning this wayone of the few times 3-D has actually worked fairly well. That is most definitely not the case here. 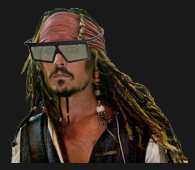 Despite being shot with 3-D cameras rather than post-converted, this tri-dimensional format is nothing if not a detriment to "Pirates of the Caribbean: On Stranger Tides." It is one of the most appalling, unattractive, worthless uses of 3-D in memory, and that's saying quite a lot. The smoky, misty, fog-drenched visuals are rendered ugly, grimy and undefined in 3-D. The action sequences become massive, headache-inducing blurs. It's enough to make a viewer want to grab a bottle of Windex and try to scrub the muck off the screen. Driven to the point of physically not being able to watch it this way any morethe IMAX glasses, by the way, are thoroughly uncomfortable to wearI opted to take the glasses off and simply view the rest of the film without them. There was the occasional blurring, but much of it was crystal-clear, as if it wasn't even in 3-D at all. Furthermore, taking the glasses off instantly revealed an altogether more vibrant and focused picture, one that a person might actually be able to get some aesthetic enjoyment from. At this point, 3-D is a giant, maddening farce and one of the most blatant, infuriating con games in the history of Hollywood cinema. 2003's "Pirates of the Caribbean: The Curse of the Black Pearl" began as a joke in most circlesit was, after all, a big-screen action-adventure based on a water ride at Disney Worldbut defied skeptics to become one of the most financially successful releases of the year. It also in many ways cemented Johnny Depp's place on the A-list; he had already been a well-known working actor for close to twenty years prior, but his quirky, scene-stealing role as side-shifting, rum-swilling pirate Captain Jack Sparrow proved that he could also be bankable. Audiences seemed to enjoy the first picture, but for me, it was more good-looking than actually good. Way too long and drawn-out at 144 minutes, the Gore Verbinski-directed blockbuster had far too many starts and stops to gain any real storytelling momentum. The sequels, 2006's "Pirates of the Caribbean: Dead Man's Chest" and 2007's "Pirates of the Caribbean: At World's End," either had too much story or none at all. Whatever the case may be, they were large-scale disasterstalky, convoluted, soulless, empty-headed, and seemingly never-ending as they gradually drifted ever closer to the three-hour mark. They did well at the box-office, too, but did anyone actually leave satisfied? Nevertheless, where there are more money and franchise prospects to mine, trilogies shall inevitably extend beyond a threepeat. Leading up to its unveiling, "Pirates of the Caribbean: On Stranger Tides" has been promoted as stripped-down and less narratively confused and complicated than the previous two installments. Gone are two of the lead cast members, Keira Knightley and Orlando Bloom as lovebirds Elizabeth Swann and Will Turner (never seen or even mentioned in passing), leaving Johnny Depp (2010's "The Tourist") to headline along with fresh ensemble addition and on-screen sparring partner/love interest Penelope Cruz (2008's "Vicky Cristina Barcelona"). In the director's chair, Rob Marshall (2009's "Nine") has replaced Verbinski. Alas, screenwriters Ted Elliott and Terry Rossio are the same, and they don't appear to have learned much from their past mistakes. Yes, the film is shorterat 128 minutes, it is a full forty-one less than "At World's End"but the plot is just as much of a hodge-podge, most of the characters are lifeless and one-note, and the action set-pieces verge on the incomprehensible due to poor camerawork, dumpy choreography, and over-caffeinated editing. So inconsequential that it begins to erase from one's memory the second each image passes by, the film is yet another poster-child example for summer movie spectacle gone bad. There is nothing to care about, nothing to think about, nothing to get excited about, and nothing to walk away with. Were it not for having wasted a $200-million budget, the case could be made that it might as well not even exist at all. Narrowly escaping from imprisonment in London, England, Captain Jack Sparrow (Johnny Depp) is off and runningor should that be sailing?as he sets out to reach the Fountain of Youth. With revolving ally/nemesis Captain Barbossa (Geoffrey Rush), as well as the Spanish Navy, also after it, Jack soon finds himself dragged onto Blackbeard's (Ian McShane) ship, Queen Anne's Revenge, by his spicy daughter, Angelica (Penelope Cruz). She and Jack once had a flingcue lots of flirtatious barb-slingingand Angelica is determined to get to the Fountain of Youth first when a prophecy foretells of her father's imminent death. Whoever seeks immortality, however, will first need to retrieve two chalices and drink a mermaid's tears from it. Or something like that. Suggested from the novel "On Stranger Tides" by Tim Powers, "Pirates of the Caribbean: On Stranger Tides" includes a scene where Angelica tries with little success to explain to Jack the cockamamie rules of claiming the Fountain of Youth. So ridiculously serpentine is this exposition that even Jack is at a loss to understand the ins and outs of his puppet masters' (read: screenwriters') narrative entanglements. And so it goes with this unnecessary fourth installment, which stands mostly apart from the other three but retains the same meandering, plodding atmosphere. Despite the shortened length, the film is still bloated at over two hours and includes plenty of downtime where the forward motion of the story lurches to a halt and characters stand around with nothing to do. Subplots involving the other groups racing to find the Fountain of Youth first are so undernourished they barely pass as a blip on the radar, while a romance between a young missionary (Sam Claflin) and a captive mermaid (Astrid Berges-Frisbey) is flatly developed and beyond dopey. Johnny Depp reportedly received a $55-million payday for reprising his role yet again as the sly, prancing Jack Sparrow, and let us just consider for a moment that he alone received over a quarter of the entire budget. Sickened at the thought? Okay, let's move on. Depp cannot be blamed for the fiasco that is this series, or for accepting the offer he receivedhe'd have to be a fool not toand he continues to energetically play the part just as he envisioned it from the get-go. What is sorely lacking, then, is any sort of arc or growth for Jack; he remains steadfast in his ways, and his colorful personality grew stale a couple movies ago. Fellow returnee Geoffrey Rush (2010's "The King's Speech") is met with deeper diminishing returns as Barbossa, a faint shadow of his former self who disappears for long stretches and rarely makes an impression when he shows back up. With the supporting players blending in with the salt-stained wood of the ships, that leaves Penelope Cruz to show everyone up. As Angelica, Cruz is vivacious enough that the viewer wishes she had more to do. Interesting to note, Cruz could almost have a game created around her pregnancy (she was with child during the filming), as her size and shape constantly alternate between shots. The sheer lack of imagination in "Pirates of the Caribbean: On Stranger Tides" is dispiriting. This one might move at a slightly clipper rate, but it's resoundingly sluggish all the same and doesn't even have any inventive otherworldly characters like the half-man/half-octopus Davy Jones from the second and third film. The best we get here are some uninspired zombie pirates that don't even match the ghostly ones from "The Curse of the Black Pearl" and a bunch of mean, sharp-toothed mermaids who aren't used to their fullest potential. The climax as Jack, Angelica and Blackbeard close in on the Fountain of Youth is also thoroughly forgettable and bland, a similar finale in 1989's "Indiana Jones and the Last Crusade" superior in every way. "Pirates of the Caribbean: On Stranger Tides" has solid production values and a pounding, catchy music score by Hans Zimmer (2011's "Rango"), but those are things that money can buy. What can't be bought, apparently, is a worthwhile script. This franchise, like many of the "arrgh! "-spouting pirates who have come before Captain Jack Sparrow, is dead in the water.